Teamtailor is an innovative end-to-end recruitment software that combines career sites with applicant tracking systems. 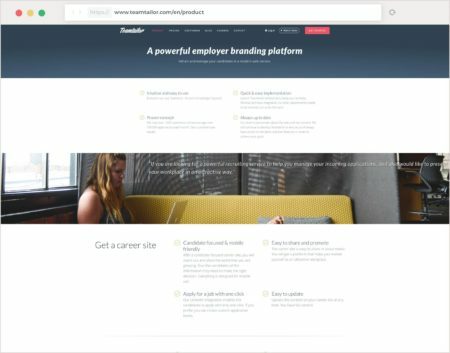 Employers can create career sites to attract the right candidates. These sites can showcase the company culture and the benefits of being part of the team. Cronofy’s documentation, sample apps and support is excellent and has enabled a fast and painless calendar integration. Not having to integrate with different calendar providers and having almost no maintenance to speak of has allowed us to focus on delivering scheduling solutions based on the real-time availability of our users quickly. Teamtailor pride themselves in being an intuitive, easy-to-use, and candidate-focused platform requiring minimal technical integration. It’s the perfect tool to successfully acquire high profile candidates, where recruiters can manage all applications and schedule interviews. Candidates can easily access the information they require and apply for a position in one easy step. Interview scheduling is time-consuming, every interview involves several back-and-forth emails and phone calls to both candidates and members of the interview panel to find times when everyone is free. Having to manage multiple calendars, monitor email conversations and phone calls, and check people’s schedules causes considerable delays to the recruiting process while adding additional stress and frustration to recruiters and candidates alike. Teamtailor have an ongoing commitment to simplify and streamline the interview scheduling process. They identified a need for an online scheduling system where recruiters and their teams can sync their work calendars and access availabilities in real-time. Their goal was to offer a fast and easy recruitment process to candidates. They also wanted to decrease the time recruiters and hiring managers spent on administrative tasks, giving them more time to spend preparing for interviews. However, building full calendar sync that works with all major calendar providers is not easy. It requires months of development time, as well as ongoing maintenance for the developers. 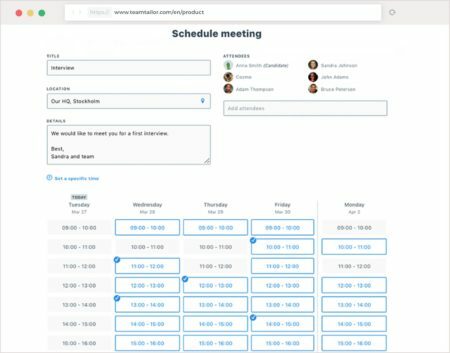 Cronofy is helping market-leading HR Tech software providers to deliver great scheduling experiences to recruiters and candidates. We understand interview scheduling challenges and their impact on the candidate experience and employer brand. This is what makes Cronofy the ideal technology partner to help Teamtailor’s developers deliver real-time and secure calendar sync to their users. Cronofy Calendar API enables a two-way, real-time full calendar sync between SaaS applications and all major calendar services providers like Google, Apple, Outlook, Office 365 and Exchange. Using our technology Teamtailor has managed to reduce development time from months to weeks allowing them to focus on building other exciting features for their users. Recruiters and hiring managers can authorize Cronofy to access their work calendars and then return their availability in real time based on the events in their schedule. Our Availability API helps meeting organizers find times when all the members of the interview panel are free. Recruiters need only to access the candidate’s profile and select ‘schedule a meeting’. They can choose who needs to be in the interview and the location. Candidates are then sent a booking link that allow them to choose the time slot that suits them best from a list of proposed times. Once an interview is booked, events are added to the panelists’ calendars and this time slot will no longer be shown as available. But Teamtailor didn’t stop there. After they achieved full calendar sync they identified another opportunity to improve the interview scheduling process. Missed interviews and last-minute rescheduling is a drain on resources and adds stress for recruiters and admin staff. Using Cronofy’s Smart Invites feature, Teamtailor is able to track what happens to the invites sent to candidates. Recruiters know if the invite was accepted, declined, or moved. Candidates don’t have to grant Cronofy access to their calendars. They don’t see any difference between a Smart Invite and a classic calendar event. This makes it easier to track attendance and reach out if someone doesn’t respond or makes a change to their interview. With the help of Cronofy, Teamtailor has further streamlined the interview scheduling process, offering a better candidate experience, lessening administrative tasks and the ability to hire the right candidate faster and simpler. Take the hassle out of integrating with individual calendar providers with the Cronofy Calendar API. If you’re a developer, sign up for free to start building straight away with our easy-to-use SDKs and sample apps. If you’d like to find out more about Cronofy, get in touch.